This is a story of survival – not of a living thing but of a collection of historical newspapers on the brink of extinction. 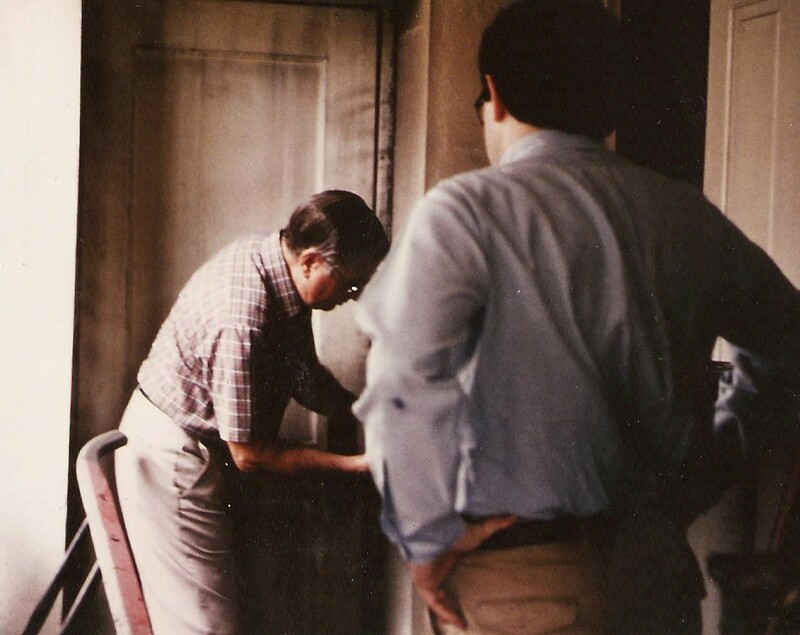 For six months the Project Team had been pursuing access to this known collection. 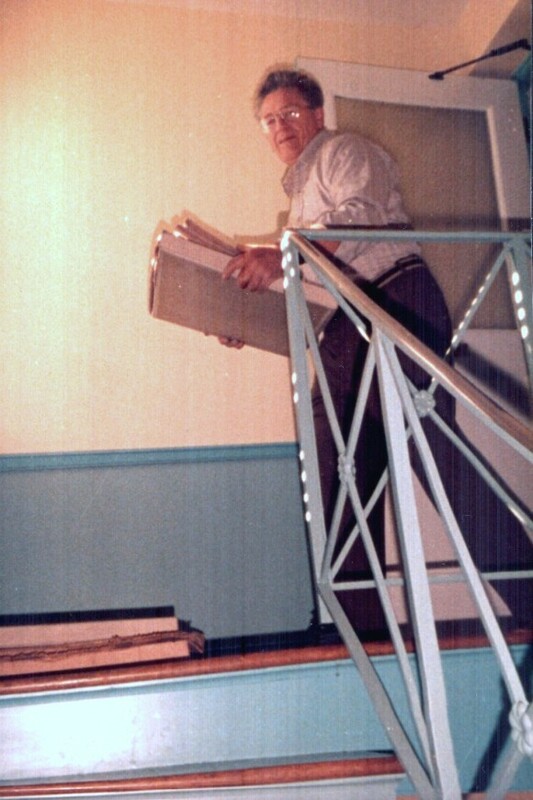 From early April through June 1985 our calls to the Northumberland County Historical Society went unanswered. 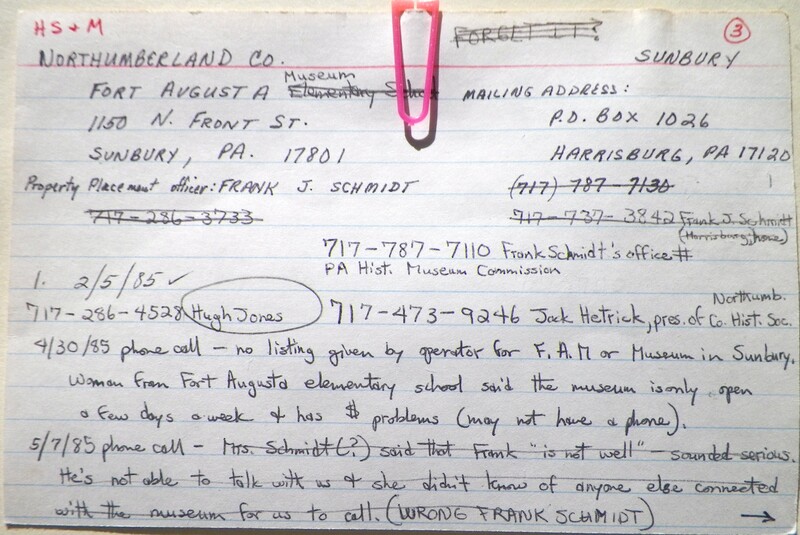 A call to the Pennsylvania Historical and Museum Commission in Harrisburg led us to only a possible contact. 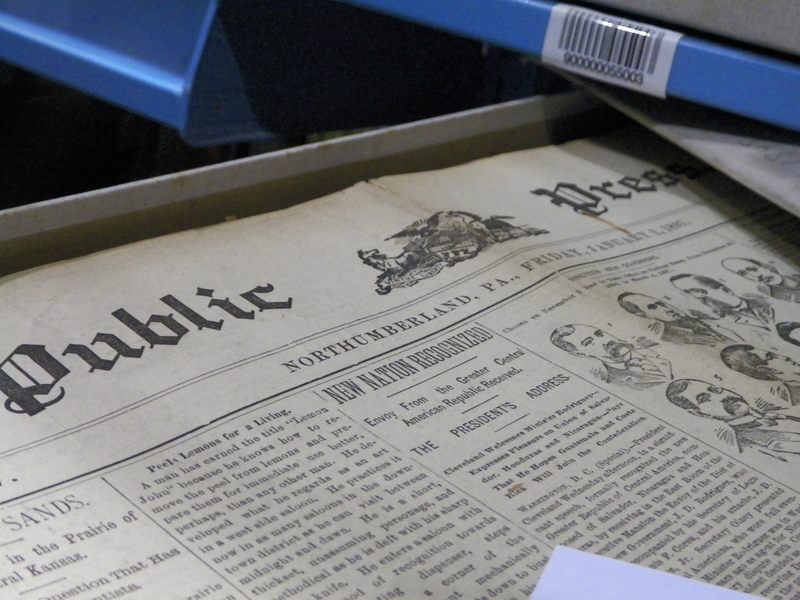 Not until a local postmistress confirmed the name of the president of the local historical society did we finally gain access to one of the most significant collections of historic newspapers in central Pennsylvania. 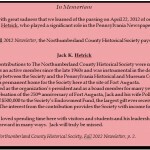 Through our research we had discovered that Northumberland County’s newspaper publishing history was rich and extensive. Founded in 1772 and situated in the interior of Pennsylvania, Northumberland County’s territory was massive covering more than one third the area of Pennsylvania. Its boundaries extended from the Lehigh and Allegheny Rivers northwards to the New York state line. According to Herbert C. Bell’s 1891 History of Northumberland County Pennsylvania, Philadelphia papers were the first to circulate in the County until the County’s first paper appeared in June 1792 – the Sunbury and Northumberland Gazette published by Andrew Kennedy. During its 220 year history from its origins in 1792 through 2012, 178 newspaper titles were published in seven different towns. 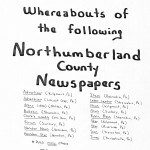 As the Project Team found out in August 1985, the Northumberland County Historical Society held the most extensive collection of historic newspapers for the County and the region. This is our story of that discovery and what happened next! During our visit to Northumberland County we broke all records to date and found a total of 29 new (previously unheard of) titles!! None were listed in Rossell’s 1978 Bibliography. A second record for the team – we cataloged 105 titles and completed 55 more LDRs in one day while at the Fort Augusta Museum (the “Vault”). The items belong to the Northumberland County Historical Society but are stored in the Museum in a locked room. Ate breakfast at Glosser Motor Inn and headed to Sunbury to meet Hugh Jones at his downtown office at 8:30 am. We arrived before 8:30 — Hugh Jones didn’t get there till 8:50 am. He then led us to the Fort Augusta Museum to the Vault. A “shadowy” picture of Fort Augusta Museum, home of the Northumberland County Historical Society, August 7, 1985. 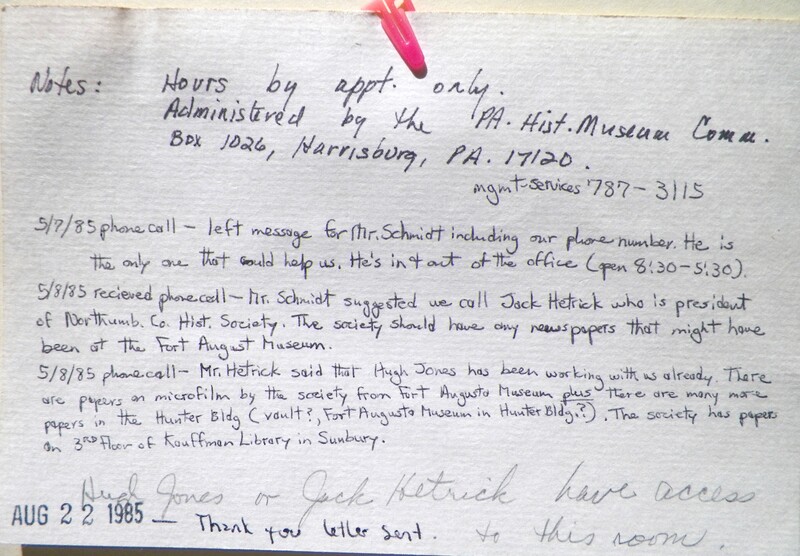 We waited for the President of the Museum/ Society [Jack Hetrick] to get there to let us in. August 7, 1985 – Mr. Jack Hetrick, President of the Northumberland County Historical Society unlocking vault door and Hugh Jones, Secretary of Society, looking on. 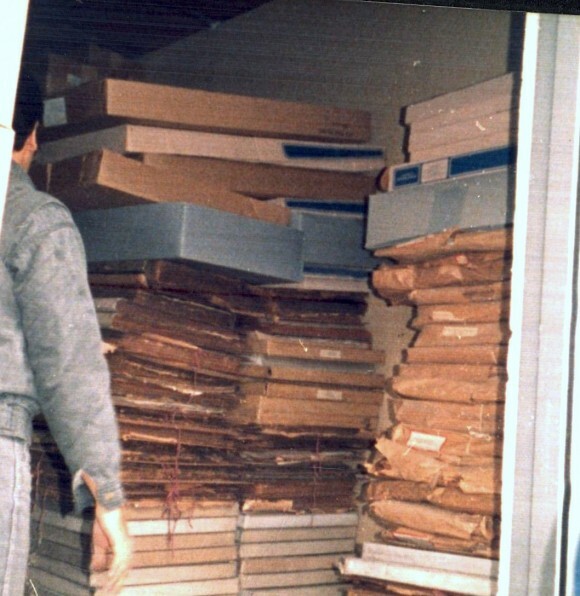 The vault had not been opened for 30 – 40 years! Becky moving boxes out so as to have room to work. Northumberland County Historical Society, Fort Augusta Museum, August 7, 1985. 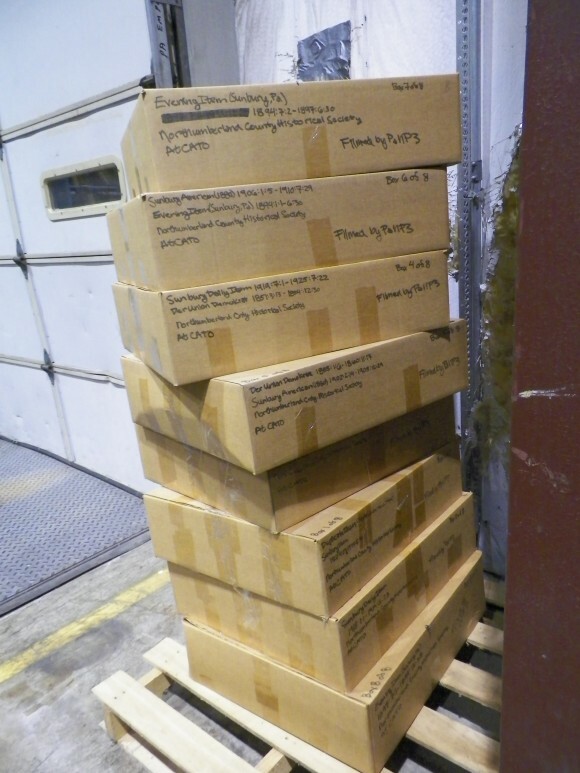 There were many, many bound volumes of titles (Northumberland Co.) and there were also boxes full of Northumberland Co. titles and single issues and titles from other surrounding counties, plus other PA counties and out-of-state titles. Inside the Vault! 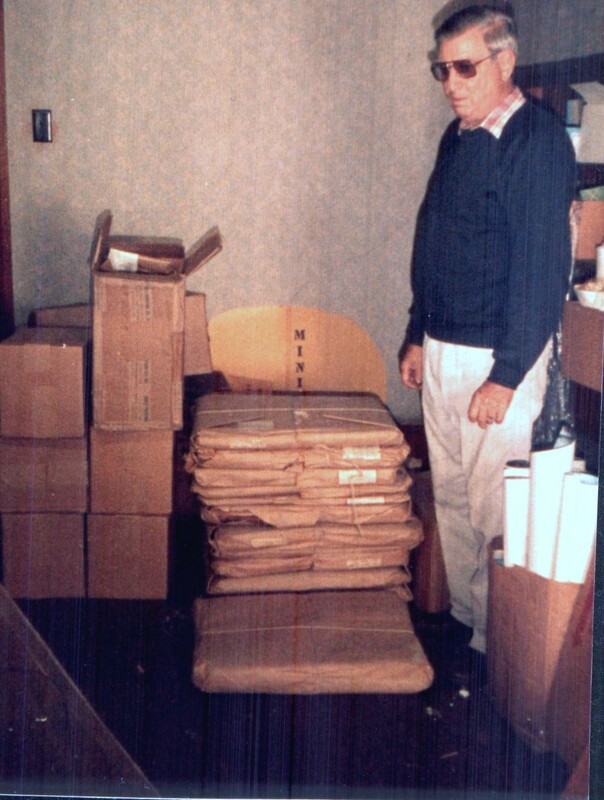 After 9 hours – we cataloged 105 titles – the most we have done in ONE DAY – August 7, 1985. It seems the vault hasn’t been opened in 30-40 years. So we had 30-40 years worth of dust and dirt to deal with plus nowhere to sit, light was one single light bulb, no bathroom plus no air!! We worked at an old desk and a podium (standing). With these conditions we began our work. Becky cataloging titles inside the vault, Fort Augusta Museum, August 7, 1985. Becky cataloged and LDRed and so did I – there was enough to keep us going for hours. Around 1:15 pm decided we had enough – went to Amity House for lunch. Back to work – took one short break – our feet were getting so tired!! We kept working all the while – around 5 pm both of us were getting so worn down – but we kept working. Finally, … finally at 7:00 pm we came to the last title. Decided to drive back to Milton area – had to be in that area 8:30 am next morning. I was so tired and Beck too but we drove to Lewisburg (near Milton) and stayed the night at University Inn. Ate dinner at 8:30 pm at Perkins connected to motel. I was so tired I got silly. 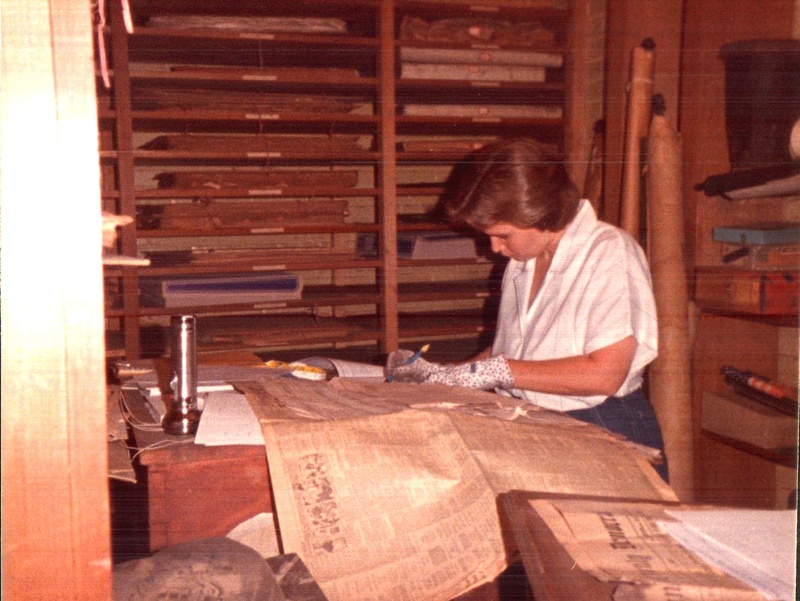 Sue cataloging titles inside vault. 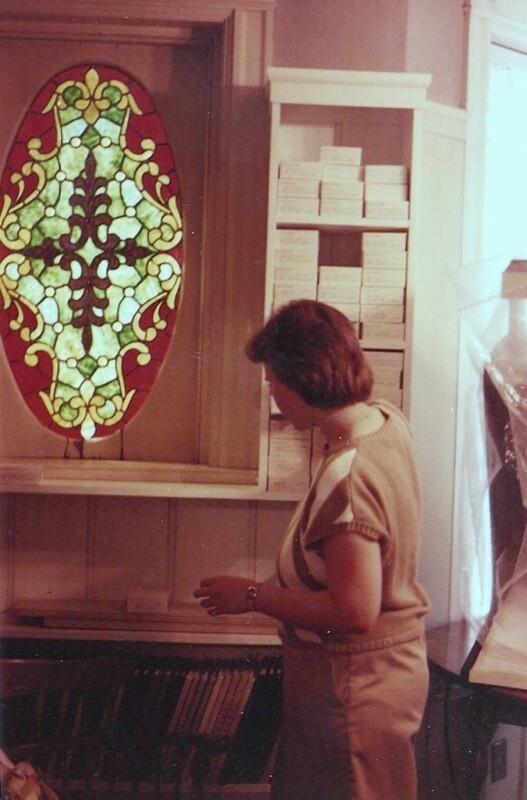 Northumberland County Historical Society, August 7, 1985. This was the most we have ever done on one day!!! No wonder we were so dead tired!! Left [Mrs. Cechmann’s house in Watsontown] at 10:35 am. Stopped for quick snack then decided to head to Sunbury to look over the holdings at the John L. Kauffman Library. Arrived at Kauffman Library 11:15 – looked at microfilm holdings and put them in order. Photocopied a history of the newspapers in Northumberland Co. published in 1973. Ate breakfast at Varias Restaurant then walked around Farmers Market set up in the street. Bought tons of fruit and veggies. Went to Kauffman Library to work on microfilm holdings. [Microfilm belongs to Northumberland County Historical Society]. Cataloged 11 Northumberland Co. titles – of which 4 were new titles we hadn’t seen before. LDRed 6 others. 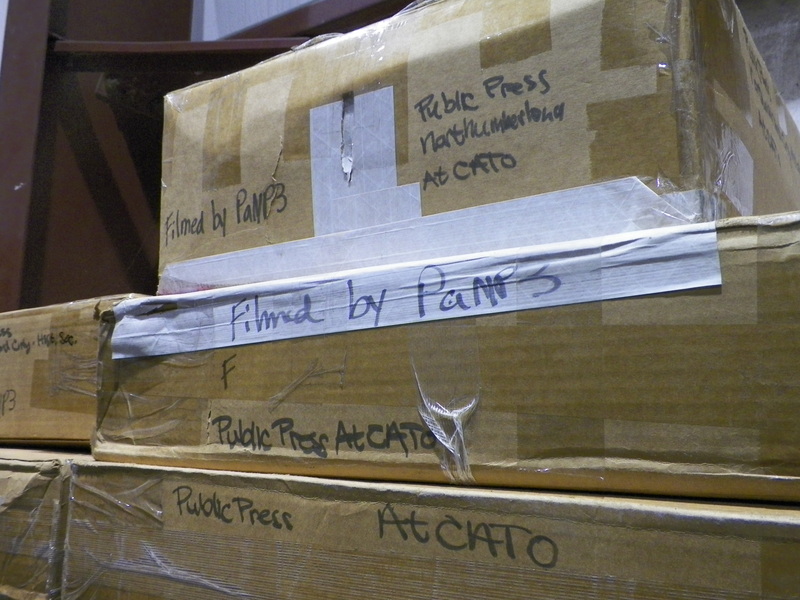 We had plenty of time to go through the microfilm – we even caught a link which we hadn’t noticed before! * It was so nice to have extra time then be pushed when time is so limited!!! 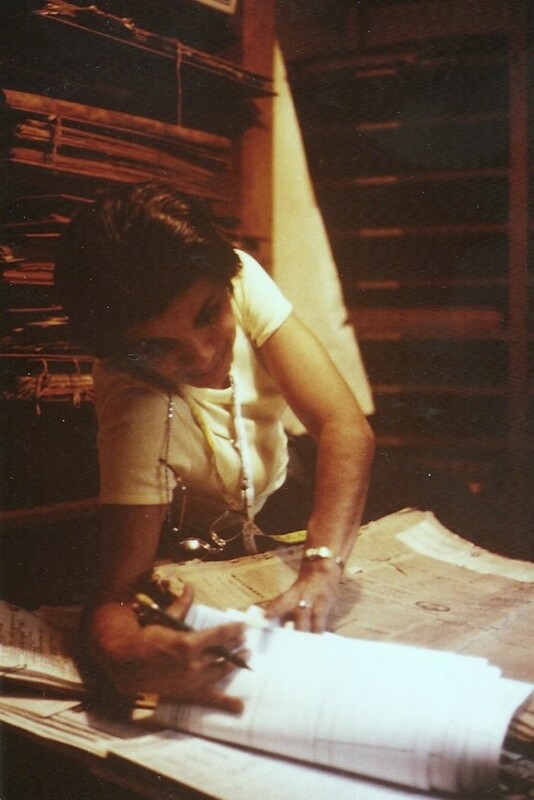 Sue checking boxes of microfilm at Kauffmann Library, Sunbury, Pa., September 6, 1985. Also LDRed Citizen Shopper belonging to Kauffman Library. Left at 3:00 pm. Headed for HOME! Arrived in Boalsburg 6:00 pm. Had stopped at Rock Oak for dinner. All in all, GOOD trip! Found 10 additional Northumberland Co. titles 7 of which were NEW titles and 3 were titles that had holdings listed in Rossell. This brings the TOTAL to 161 titles known to have been published in Northumberland Co. to date have found 76/161 = 47.2% — Added star for Herndon on the MAP of STARS. Sue with Jack Hetrick, President of the Northumberland County Historical Society, 3rd floor of Kauffman Library, September 6, 1985. 1) Montandon Post Office; 2) Big T Family Restaurant; 3) Weis Store, Sunbury; 4) Court House, Sunbury; 5) The Market House, Sunbury; 6) Kauffman Library; 7) Sunbury Post Office. Arrived at Kauffman 10:00 am – worked till 12:30. 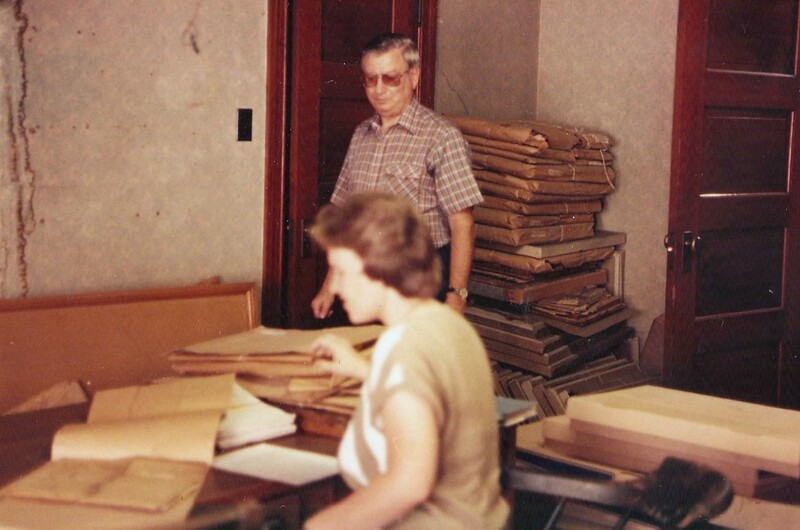 Jack Hetrick stopped by and so did Hugh [Jones] – he brought several of his personal papers for us to catalog. Went to Sandy’s Station Deli for lunch then back to the 3rd floor 1:15 to 3:45 pm. It was so hot and humid!! It must have been 100 degrees!! All in all, cataloged 12 Northumberland Co. titles – 5 newly found titles, 2 listed in Rossell with holdings we hadn’t seen before and 1 which was listed in Rossell but NOT IDed. PLUS we LDRed 21 other titles – Northumberland Co. and various other surrounding counties. PLUS we cataloged 4 other surrounding county titles. 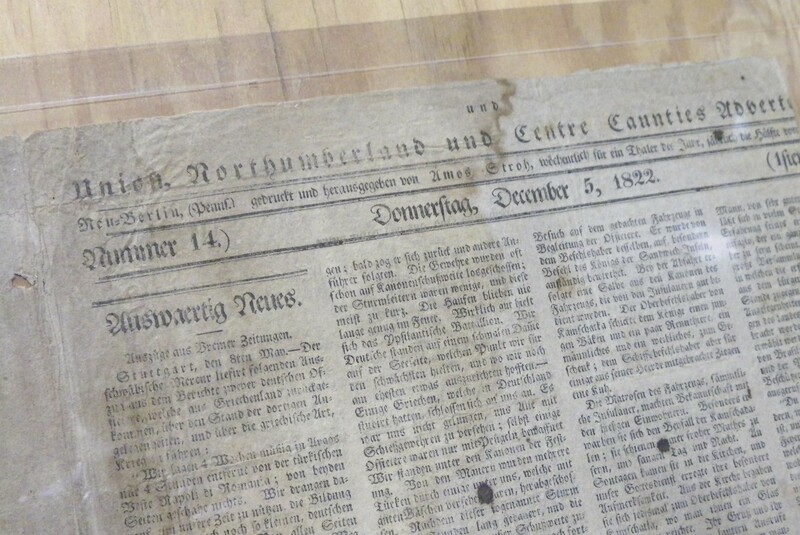 Beck found a German paper Der Union Demokrat from New Berlin which was on our Union Co. “Needs” list! To keep track of everything, the Project Team recorded all communications (phone calls, letters, visits, etc.) on 4 x 6 index cards for each site visit and/or contact person(s). 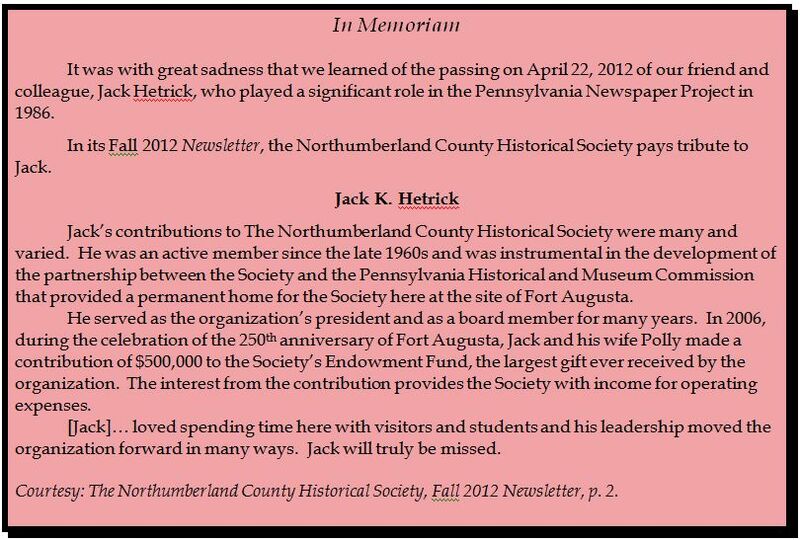 Four Cards were made for Northumberland County Historical Society in our effort to identify contacts and locations of newspapers. At one point, we were tempted to FORGET IT! 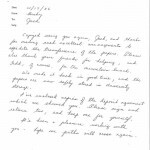 8/22/85 – Sent Thank you letter. 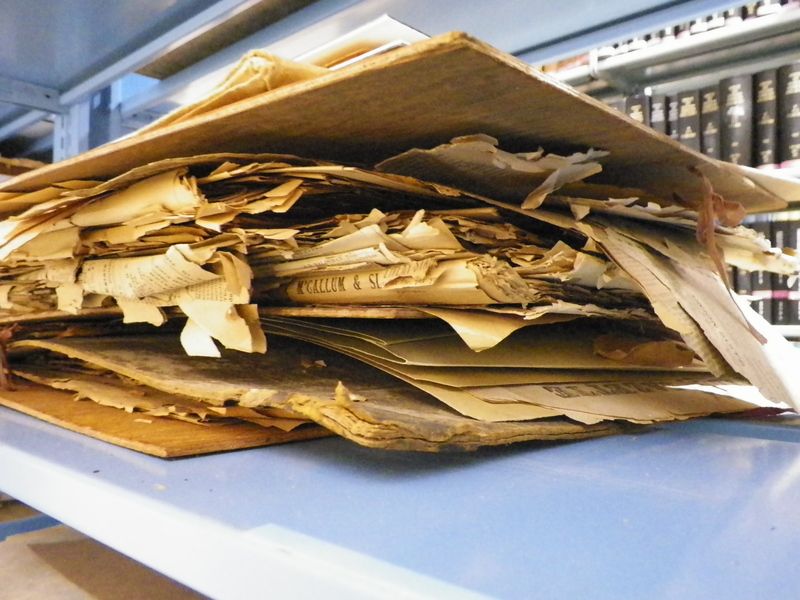 Here follows the list of the 180 titles belonging to the Northumberland County Historical Society discovered during our three visits to catalog all their holdings. Some titles were unique; for others, we just recorded the holdings; some were on microfilm; paper issues were in the Vault; paper and film were found in the Kauffman Library. Titles included those published in the County, in other Pennsylvania towns and cities, and in other states. Over a ton of newspapers were located, inventoried, cataloged! The future of the Society’s existence was unknown – lack of funds, lack of staffing and uncertainty about the future of its buildings. 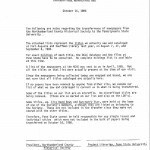 Then, sometime between inventorying the collections of the Northumberland County Historical Society (August, September 1985) and the Journal Entries below (October 1986), a series of phone calls occurred between Mr. Jack Hetrick and the Penn State Project Team, which resulted in an agreement to house the Society’s collections at the Penn State University Park Campus. Back to W308! [following Advisory Board Meeting in Harrisburg the previous day]. Went through mail from yesterday. Nothing exciting. Beck got on the phone and talked to Hugh Jones and then Jack Hetrick. After much discussion and setting up time and place – Beck and Jack agreed on when and where we (Beck, Smith? 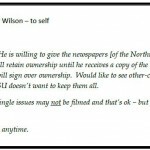 and I) would come on Oct. 16th to pick up the newspaper collection of the Northumberland Co. 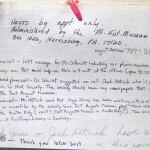 Historical Society and bring them back to PSU. 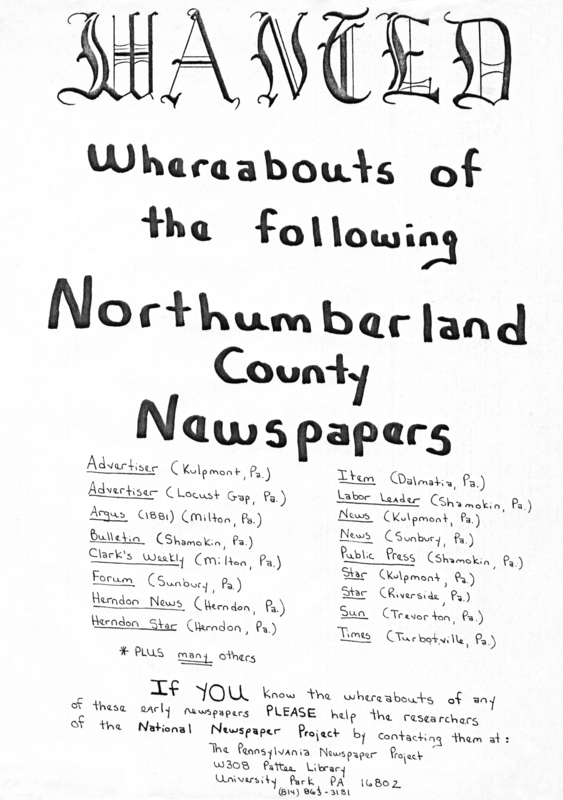 …Beck talked to Barbara [Smith] about Northumberland Co. newspapers that we’re planning to pick up this Thursday. Seems Barbara didn’t realize they were going to give them to PSU. Barbara still must decide where we are going to put these here at PSU. What a day! We were both on the phone almost all morning. Talked to Peter [Gottlieb] about having a couple boxes to take w/us tomorrow. Spent some time discussing the problems w/getting the Northumberland Co. Hist. Soc. papers w/o having Jack Hetrick sign anything. Peter suggested that we prepare a list of titles that is going to be transferred to PSU for Jack and us to sign tomorrow. Maybe Jack would also agree to sign a “Deposit Agreement” in which he would still remain the owner but the papers would be deposited at PSU. 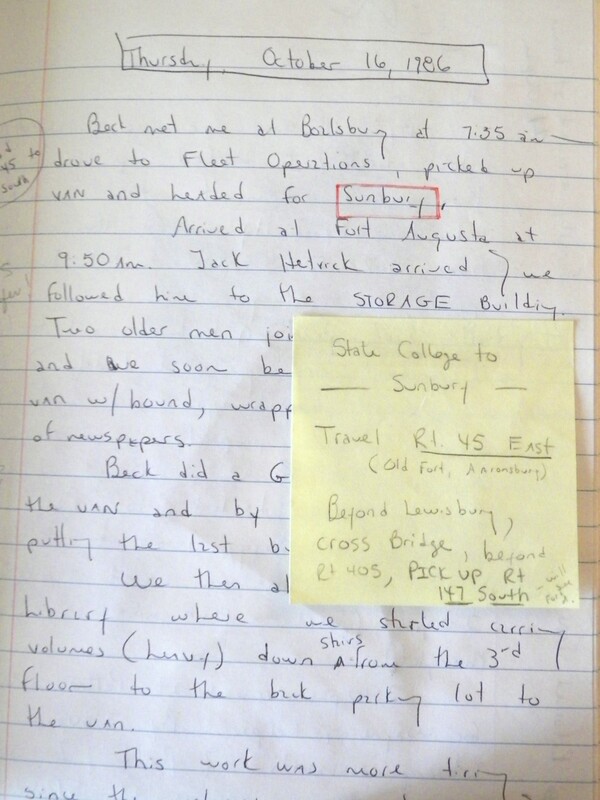 The yellow sticky note is pasted on the Journal Entry page with directions from State College to Sunbury. Remember, GPS and Map Quest did not exist! 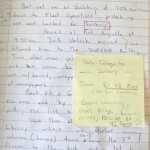 Beck met me at Boalsburg at 7:35 am – drove to Fleet Operations, picked up van and headed for Sunbury. Arrived at Fort Augusta at 9:50 am. 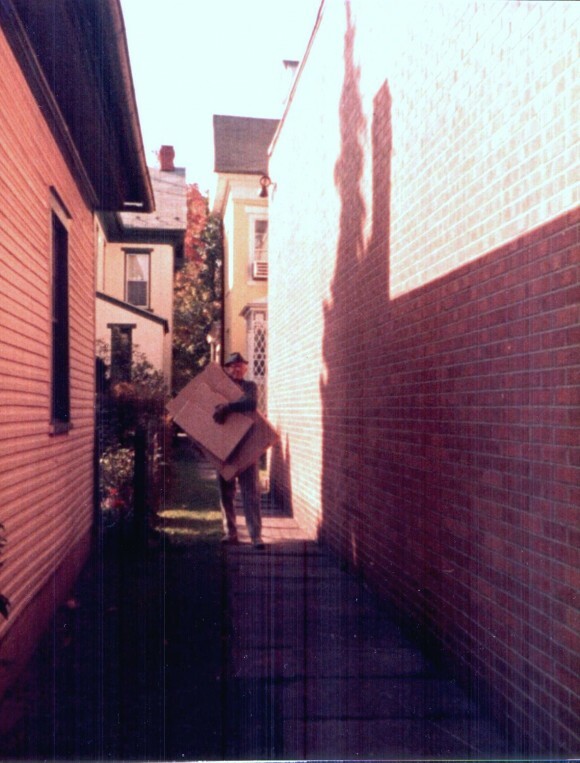 Jack Hetrick arrived and we followed him to the STORAGE Building. Carrying out the wrapped and bundled newspaper collection. Piles of wrapped and boxed newspapers housed in the Storage building. 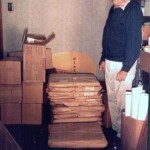 Two older men joined Jack, Beck and I and we soon began loading the van w/bound, wrapped, loose volumes of newspapers. Beck did a GREAT job packing the van and by 10:30 we finished putting the last bundle in. We then all drove to Kauffman Library where we started carrying volumes (heavy) down stairs from the 3rd floor to the back parking lot to the van. Carrying volumes downstairs, then outside to the waiting van. 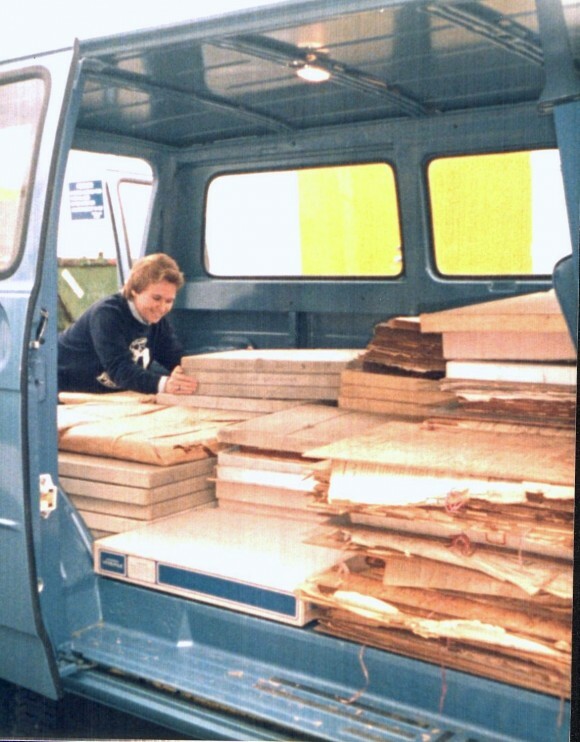 This work was more tiring since the volumes were heavier and we had longer to carry to get to the van. Sue loading the van (and still smiling!). By 11:00 am we were finished! Jack, Beck and I washed up and Jack then signed the document that we had indeed physically moved their holdings from STORAGE to PSU. Jack had no problems signing. Jack then took us out to lunch at Tedd’s landing. Met Tedd and then after lunch Jack gave us the nickel tour of Tedd’s property overlooking the Susquehanna River (Beautiful view). Stopped at Buggy Town to tell [i.e. phone call] Wayne Baumgardner that we would arrive around 2:00 pm (earlier that we originally thought). [Remember, no cell phones yet]. 2:10 pm arrived at Pattee. Waited for Wayne and helper. By 3:00 pm two Library assistants and Beck and I were unloading the newspapers at STOW-AWAY. 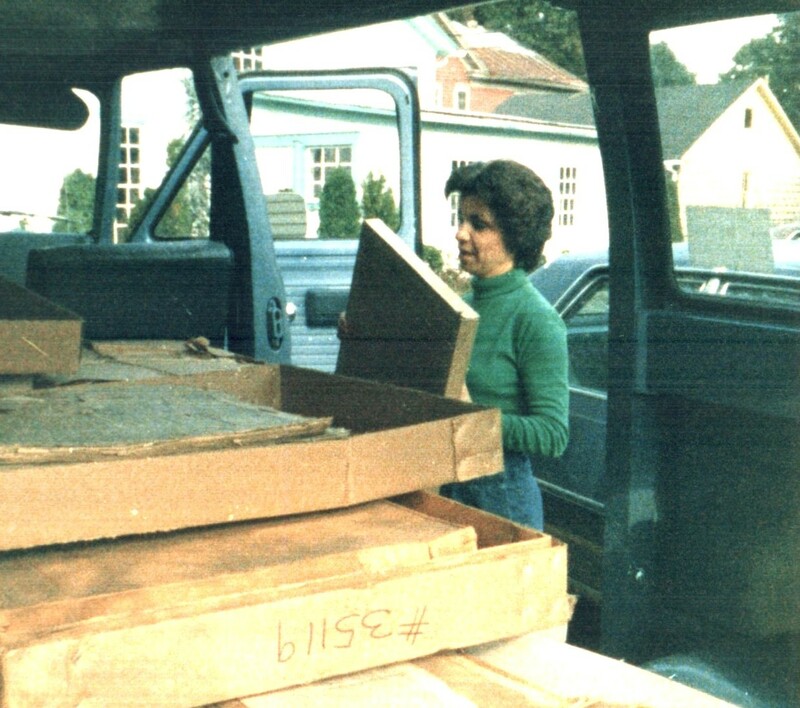 Sue at Stow-Away, State College, Pa. storage unit. By 3:30 pm we finished. Dropped off students. Returned van to Fleet Operations and finally arrived at home 4:00 pm. The following agreement was signed by Jack Hetrick and Becky Wilson. An official Memorandum of Deposit was later signed Mr. Jack Hetrick and Dr. Barbara Smith on October 24, 1986. 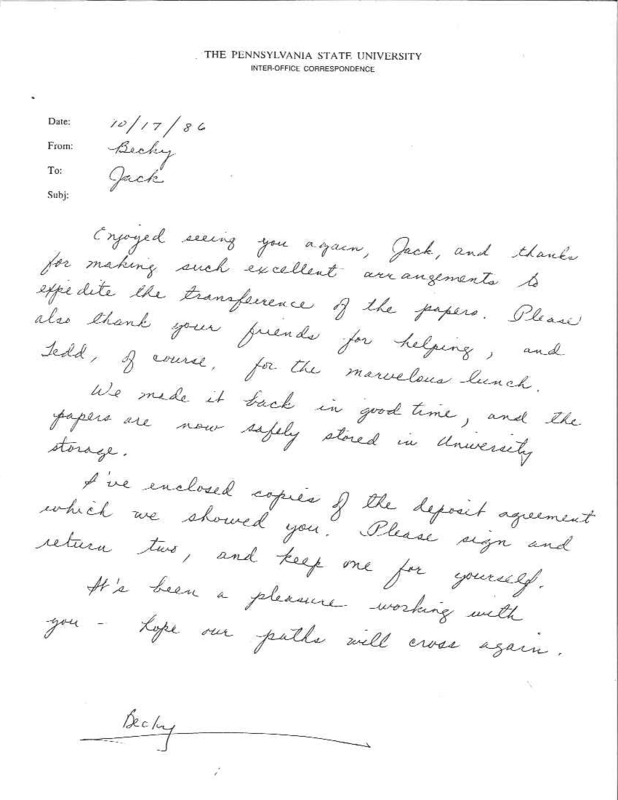 Note from Becky to Jack following the transfer of newspapers. 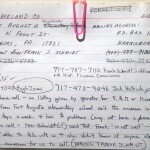 Barbara had some problems w/the [official] depository agreement Beck had typed concerning the Northumberland Co. Hist. Society collection. Beck worked on photocopying, etc., etc. the Depository Agreement signed and returned by Jack Hetrick. I guess Peter G[ottlieb] will house the official document since they will eventually be housed in his area. 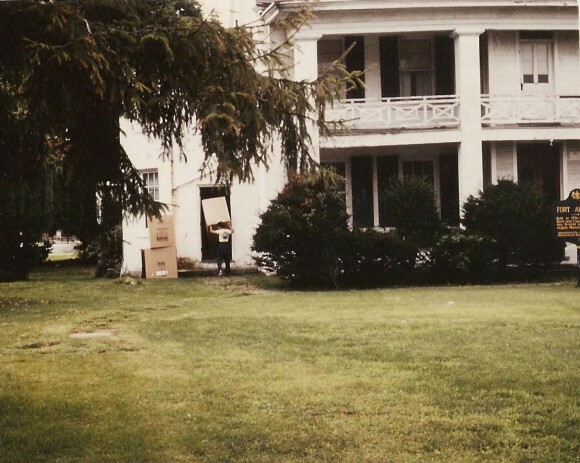 The collection remained in STOW-AWAY in State College, Pa. from October 1986 to the mid-1990s, at which time it was moved to a secure Library Annex facility owned by the Penn State University Libraries, where it remains. 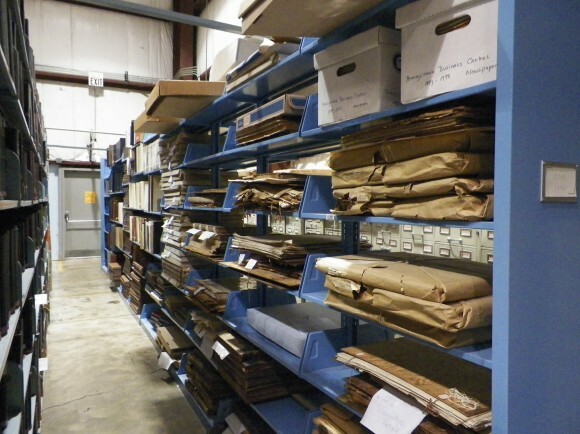 This is the current state of the Northumberland County Historical Society’s holdings at the Penn State University Library, October 19, 2012. One of the rare titles found in the Vault, and now held at Penn State is the December 5, 1822 issue of Die Stimme von Union, Northumberland und Centre Caunties advertiser. Published weekly by Amos Stroh in New Berlin, Union County, Pa., Die Stimme von Union, Northumberland und Centre Caunties advertiser, flourished from 1822 to 1823. This December 5, 1822 issue is the only known surviving copy. 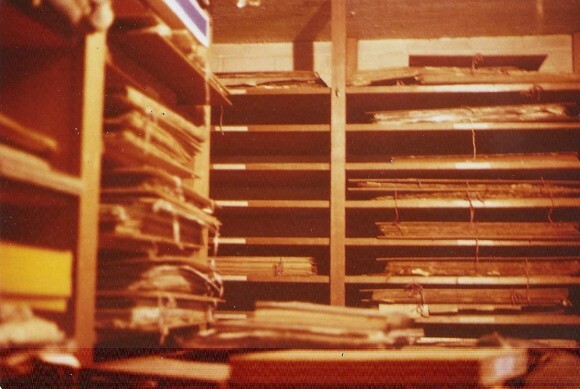 As a result of the Pennsylvania Newspaper Project, 1985 – 1989, and the Pennsylvania Newspaper Project, 2006 – 2008, the following titles from the Northumberland County were microfilmed and preserved for future access and digitization. Northumberland County Titles NOW Online! 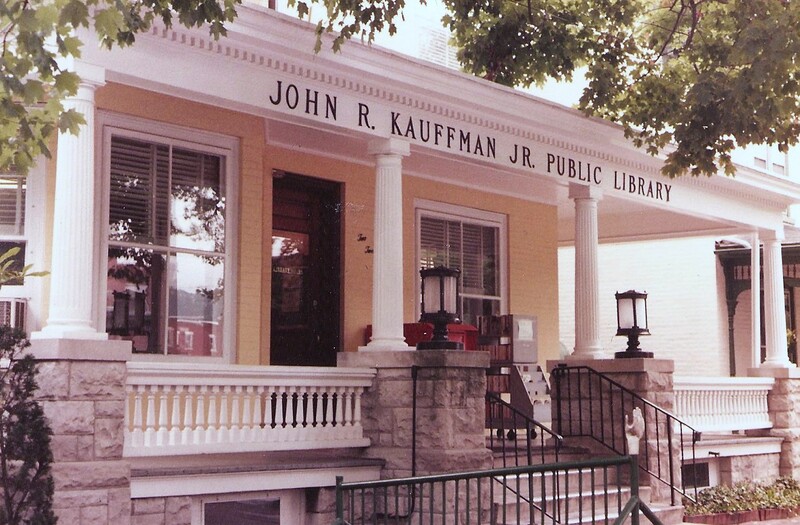 As of August 2012 the following two Northumberland County titles have been added along with 47 others, as part of Pennsylvania’s contribution to the Library of Congress’s Chronicling America Newspaper Database. The Sunbury American and Shamokin Journal was born in response to a political emergency but lived on to become the oldest 19th-century newspaper in Sunbury, the seat of Northumberland County. What became Sunbury was once Shamokin, a cluster of three villages and the Indian capital of central Pennsylvania under Shikellemy, chief of the Six Nations. The area was the westernmost settlement in Pennsylvania in 1724 and the site of Fort Augusta in 1756. Sunbury was the seventh and last proprietary town in Pennsylvania, laid out in 1772 for the heirs of William Penn, who owned the property and sold the original lots. Located near the confluence of the north and west branches of the Susquehanna River, Sunbury became a port on the Pennsylvania Canal and a major railroad center. The area boomed with the development of local anthracite coal mines and various industries such as textile mills. 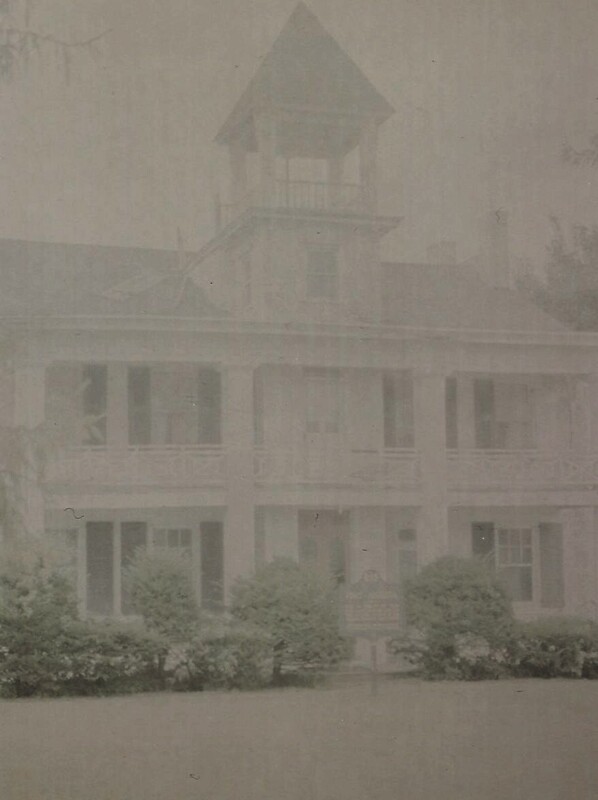 Thomas Edison installed the first successful three-wire electrical lighting system in the United States in Sunbury, illuminating the City Hotel on July 4, 1883. Northumberland County in the 1830s was overwhelmingly Democratic, and receiving a nomination from the party was tantamount to winning the election. This meant that any campaign battles took place at the nominating convention. Twice-elected state legislator Charles W. Hegins, taking re-nomination for granted, was surprised to be preempted by a rival candidate from Milton at the 1840 county Democratic convention. The upstart was supported by the two local Democratic newspapers, the Sunbury Gazette and the Milton Ledger. Hegins’s friends promptly organized another convention in protest and nominated him, but there was no newspaper to promote his campaign. Within ten days of the protest convention, on September 12, 1840, Henry B. Masser, the deputy attorney general for the county, and printer Joseph Eisely launched the Sunbury American and Shamokin Journal, initially giving away large numbers of copies as there was no subscription base. Despite the heroic efforts, Hegins’s opponent was narrowly elected, but the new four-page publication with the unwieldy slogan (“Absolute acquiescence to the decisions of the majority, the vital principle of Republics, from which there is no appeal but to force, the vital principle and immediate parent of despotism. – Jefferson”) found its niche within the available reading population. Amended to become simply the Sunbury American in 1848, the newspaper provided a solid weekly offering of national and regional political coverage, fiction, reprinted news and feature stories from all over, county legal notices, local news, and advertising. Masser customarily advertised his law office directly below the subscription and advertising rates on the front page. The newspaper was Democratic until the election of Abraham Lincoln in 1860, at which time it became Republican and remained so. Masser was joined in 1864 by Emanuel Wilvert, who had lived with the Masser family in the 1850s while a printer’s apprentice. In 1866, Masser’s nephew, Norman S. Engle, joined the business. Emanuel Wilvert’s son, Austin, worked with the American for a few years, during which time (on April 11, 1879) it merged with the Sunbury Gazette, at one time a great rival, and became the Sunbury Gazette-American. See also: Maj. Jack K. Hetrick, 94, Northumberland. The Daily Item, Sunbury, PA. April 23, 2012. …have been microfilmed and now digitized. Some titles have come full-circle and are no longer on the brink of extinction and obscurity.